Since the launch of Microsoft Windows XP, I’ve spent a lot of time helping friends and family set up wireless routers. Over the past few years, I’ve also helped a number of people configure wireless networked devices connected to home theater systems that stream music from a host PC and I’ve helped them add IP based Internet camera to their home networks. When Windows XP first launched, it was not an easy task to setup a home network and perform these tasks. A network setup wizard was provided, but it was basic and didn’t handle enough of the work to make home network setup a painless experience. And not too long ago, the only way to setup a secure wireless network using a wireless router was to log in to a web based administrative page on a router and then navigate an often confusing web interface. Many people didn’t even bother to setup wireless security because it was too difficult. Eventually, a number of manufacturers included proprietary, non standardized setup programs and wizards. Two developments over the past several years since the launch of Windows XP have provided some relief. UPnP, which I first wrote about in May 2002, was the first major step in enabling an easier network setup because it provided the basic ability to discover a new device on the network and access its web based administrative page (Presentation URL). The second was Windows Connect Now (WCN), which I first wrote about in June 2005 which provided better end user tools to setup computers and devices. This technology enabled Windows XP users to setup a wireless network using a wizard and a USB flash key. The devices that could be configured in this manner needed an onboard USB port. These two new technologies took time to make their way into retail residential equipment. UPnP is now ubiquitous and USB based WCN has begun to appear, most notably in a group of devices from D-Link systems. This is wonderful technology, but there are still a limited number of wireless routers and peripherals with a USB port. I’ve got very good news for anyone who has struggled to setup a secure, simple wireless network that includes computers and devices. Features built into Windows Vista coupled with redesigned and intelligent wizards can make this an easier process. Windows Vista builds upon UPnP and WCN and adds a group of new technologies, referred to as Windows Rally, which will greatly simplify the setup and maintenance of a secure home network. One of these new technologies, Link Layer Topology Discovery (LLTD) works with both wired and wireless devices to enabled automatic topology discovery. LLTD has optional Quality of Service (QoS) Extensions that applications can use to diagnose problems, especially those involving signal strength on wireless networks or bandwidth issues in home networks. Fortunately, many recent existing devices will be upgradeable via new firmware to support LLTD so you may not need to purchase new routers, Internet Cameras, or other networked devices to take advantage of LLTD features. All computers running any version of Windows Vista also support LLTD. Microsoft is working on back porting LLTD to Windows XP via a Service Pack or QFE update. 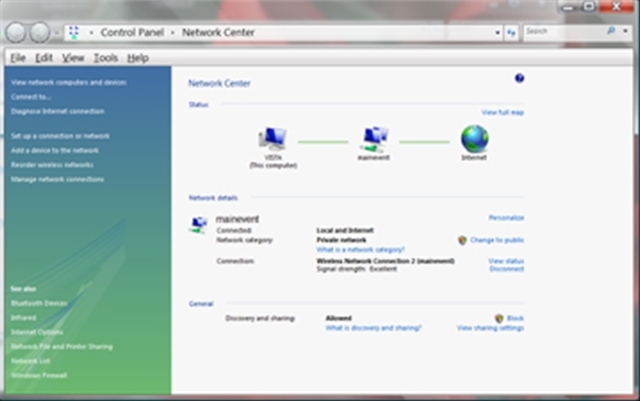 Windows Connect Now in Windows Vista now is coupled with a new Wi-Fi Alliance standard called Simple Config (working name, subject to change). This technology lets Vista discover an unconfigured router/access point or a device and setup a wireless network over a wired Ethernet Connection. Simple Config uses a 4 or 8 digit to authenticate and confirm that the user has permission to configure a device. Microsoft’s Networking and Devices team and Buffalo Technology provided me with an off the shelf wireless router running developmental firmware which implements Simple Config and LLTD. D-Link Systems provided me with developmental firmware for their DCS-950 Internet camera that implements LLTD. Using the Buffalo Technology hardware provided to me, I was easily able to setup a new wireless router using WCN with “over the wired network” Simple Config. While I was using developmental firmware, it was very clear that this technology is a huge ease of use win for home users. 8. A default network name will display. Accept it or type a new name. (This name will appear in wireless network list after setup is complete). 10. Using advanced network security options, a drop down menu lets you select different security types, such as WPA2-Personal, etc. 11. Type in the 4 or 8 digit PIN provided by the manufacturer then click next. 12. Specify File and Printer sharing options, and then click next. 13. Windows Vista now configures your wireless access point/router. 14. You can now use WCN and a USB flash key to setup the wireless network you’ve just configured on other Vista or Windows XP computers. 15. The network you’ve just setup is now available in the list of Wireless Networks you can access on the computer used for setup. Another major new networking technology called Link Layer Topology Discovery (LLTD) provides automatic discovery of LLTD compliant devices. 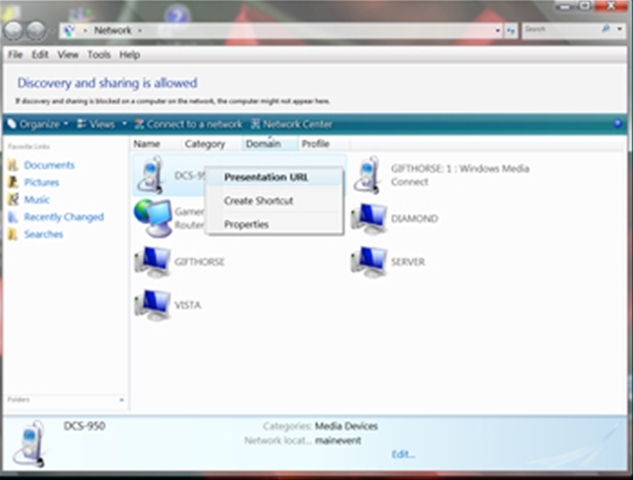 LLTD in combination with UPnP can classify the device’s capabilities, show a unique embedded icon, and display it on Windows Vista’s Network Window (see Figure 1) and accurately position the device on the Network Map. Figure 1: The Network Window shows discovered devices. Right clicking a UPnP enabled device will display a shortcut menu, if available. 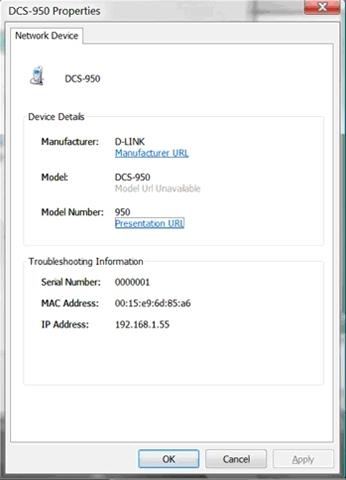 D-Link’s DGS-950, with developmental LLTD firmware and UPnP support is identified as belonging to the Media Devices category and at the “mainevent” Network Location in the lower portion of the main Network Window. Double clicking the device icon will also open the device’s Presentation URL (embedded administrative web page), if one is available using UPnP. Right clicking the device’s icon in the Network Window displays an entry on a shortcut menu to invoke/display that page. 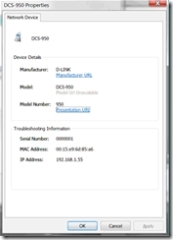 The properties link on the shortcut menu displays a window with a link to the presentation URL, the vendor’s web site and other information about the device, such as its MAC address, serial number, and IP address as shown below in Figure 2. Figure 2: Device Details for a UPnP/LLTD D-Link DCS-950 Internet Camera display information in a properties window. Vista’s Network Center (Figure 3) is a one stop command and visualization center that aggregates almost every wizard and control application related to Networking. There are several paths to reach the Network Center including selecting Network from the Start button and then Network Center or you can use Start button, Control Panel, Network and Internet, View Network Status and Tasks. Figure 3: Network Center displays the connection status of your computer graphically. A red X would appear on a network segment where connectivity was broken, helping you trouble shoot what’s wrong. In the image below, my Vista laptop computer is successfully connected through the “mainevent” (wireless) network. The signal strength is displayed, and additional links are available to view the Status of the connection. 1. View network computers and devices displays the same view as Figure X above. Depending on the selection made, a wizard based process guides you through the steps. Earlier in this column, I demonstrated how to set up a new wireless network using WCN Simple Config. 1. 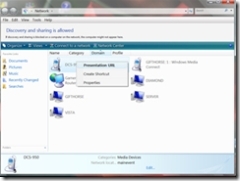 Add a device to the network uses Windows Connect Now technology to discover an unconfigured device connected to your existing network and a similar wizard to the one used to setup a new network. 2. Reorder wireless networks displays the list of configured wireless networks and allows you to change the order. It also allows you to create and manage wireless network profiles. 3. Manage network connections displays the network adapters and their current status. The state of Discovery and Sharing is shown in Network Center with a link to Network File and Print Sharing (see Figure 4) that lets you customize who has access to shared content on the computer, the Public Folders, attached Printers, and the contents of your Media Library. 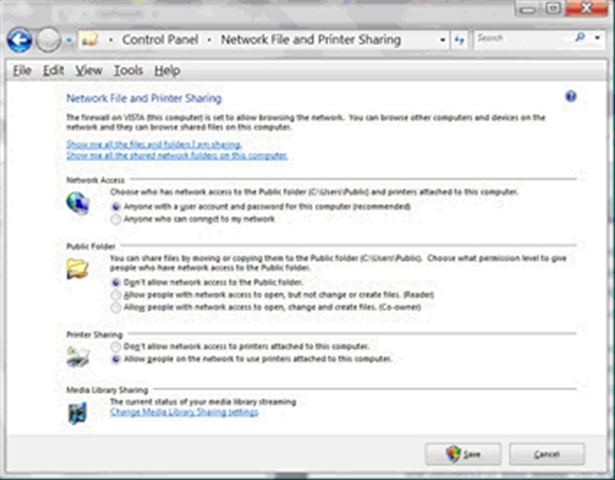 Figure 4: Network File and Printer Sharing – many sharing settings can be changed directly from this control panel applet. Tip: To share a folder not in the Users folder hierarchy, open Computer from the Start button, navigate to the folder you wish to share, right click this folder and then Share. A link labeled View Full Map in the Network Center window displays a graphic representation of the computers and devices on your network. The Network Map (Figure 5) relies on LLTD to map the layout of your network. 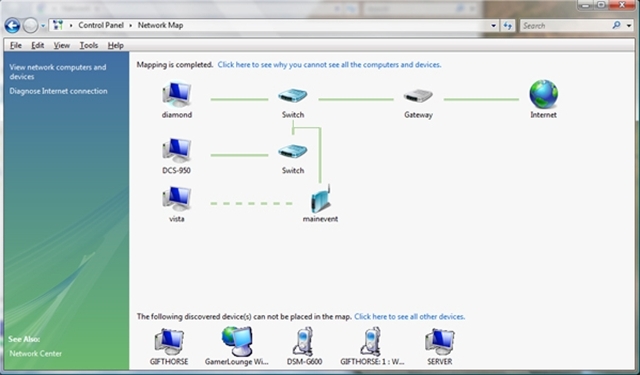 Figure 5: Windows Vista computers and devices with LLTD firmware will be placed on the Network Map where you can graphically view how they are interconnected. As you can see in the image above, in my Network Map I have three Windows Vista computers, my D-Link DCS-950 camera with LLTD developmental firmware connected through switches and a wireless access point all connected to a residential gateway that connects to the Internet. As of July 11, 2006, Microsoft officially ended support for Windows 98, Windows 98 SE, and Windows Millennium. There will be no further security updates or patches. If you’re still using any of these older versions of Windows, consider upgrading your operating system if the computer meets minimum Windows XP specs. Or consider replacing the computer with a new Vista ready computer. Prices for reliable computers even at the entry level have never been lower. 1. This printer was no longer supported by HP and x64 drivers for Windows Vista will not be available. 2. I did not want to hardwire the printer to a laptop and I wanted the printer to be located in my first floor utility room where my washer and dryer reside. 3. I don’t have wired Ethernet on any floor except my third floor home office. As I researched the x64 driver issue on the HP support site, I learned that the x64 driver for the HP DeskJet 990C would be a good match for this now obsolete but still usable printer. My next step was to consider a wireless print server of some kind. I found D-Link’s DPR-1260 4 port wireless print server online. This is an impressive wireless print server with two USB and two parallel ports. It even supports many multi function print/scanner/copier all-in-one devices. And it supports WPA-Personal for strong wireless security. 11. The wizard offers the option to share the printer. Since it is not necessary to access this printer in this manner, I did not select this option. Instead, I set this printer up on my other Windows Vista and XP computers individually. I’m really happy with my wireless print server solution. I can now wirelessly print a quick shopping list or a web page to my ground floor printer. I’ve brought new life to this old printer by finding a compatible driver for Windows Vista x64 and will have the convenience of a second printer for years to come. The new networking technologies and wizards in Windows Vista, in combination with support from the manufacturers of residential/home networking equipment will clearly provide the easiest network setup experience possible. The “connected, networked home” is becoming mainstream, and thanks to Windows Vista, your home network will be easy to configure, expand, and trouble shoot.